I grew up in rural Illinois, with pretty amazing parents, and I spent a lot of time — and I do mean a lot of time — outside. Sure, there was playing in the lake and the creek, and there were garden chores and yard mowing, but there were also school projects and non-school educational projects. My favorite of these amateur naturalist activities, I think, was the leaf collection. I liked the process and the finished product of it all: Walking the woods around my house, visiting Lodge Park, Allerton Park, and Valentine Park to gather specimens; researching the leaf types, shapes (pinnate is still a favorite word of mine), and Latin names; and ironing the leaf to white typing paper under waxed paper. The finished “book” was usually a rumply stack that crinkled, all bound with yarn. Beautiful, I think. But another project that I’d more or less forgotten about was watching caterpillars metamorphose. Until last week. Shortly thereafter, I was the proud keeper of four fat, black-and-bright-green caterpillars. As a kid, I would have called them yellow swallowtail caterpillars, but a little Google searching tonight has me questioning the accuracy of that claim. Instead, they might be black swallowtails, or papilio polyxenes. At any rate, we had monarchs more often; our property had lots of milkweed that they could eat. 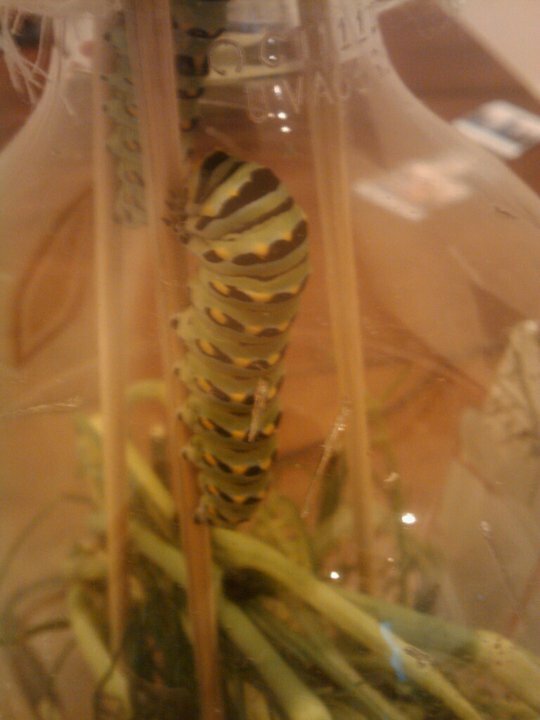 We put some wild fennel in their fancy two-liter bottle cage, and watched them munch away. Fast. They doubled in size within days, and increasingly large, round, fennel-smelling droppings were everywhere. Over the next few days, we went through more fennel, dumped more feces, and got ever fatter caterpillars. It was more dramatic than I remembered as a child. Maybe someone else was responsible for dumping the feces daily. After your caterpillars have eaten you out of house and home, they will wander for a while before starting to spin a silk pad for pupation. They will again lock their rear legs into the silk mat. Swallowtails and a few other species will also make a silk sling and hang in a ‘C’. Monarchs, Painted Ladies, and others will hang in a ‘J’ shape. After a day, they will start to wiggle or move like an accordion. Their skin will again split behind their heads and they will wiggle for about three minutes. [Ed. Note: Erl says she saw one of hers actually doing this!] During this time, their skin will work toward thier [sic] back legs. When the skin is almost totally off, a pupating caterpillar will extend its cremaster around the skin and attach it to the silk pad. Since it is wiggling out of its old skin, it needs a new grip on the silk pad. After the cremaster is firmly attached, in most cases the old skin will fall off after more twisting and wiggling. They’ve all formed chrysalises as of this morning…. ← Happy Birthday, Wendell Berry!